Take a journey through time and genres to discover stories where queer teens live, love, and shape the world around them. Seventeen young adult authors across the queer spectrum have come together to create a collection of beautifully written diverse historical fiction for teens. From a retelling of Little Red Riding Hood set in war-torn 1870s Mexico featuring a transgender soldier, to two girls falling in love while mourning the death of Kurt Cobain, forbidden love in a 16th-century Spanish convent, or an asexual girl discovering her identity amid the 1970s roller-disco scene, All Out tells a diverse range of stories across cultures, time periods and identities, shedding light on an area of history often ignored or forgotten. 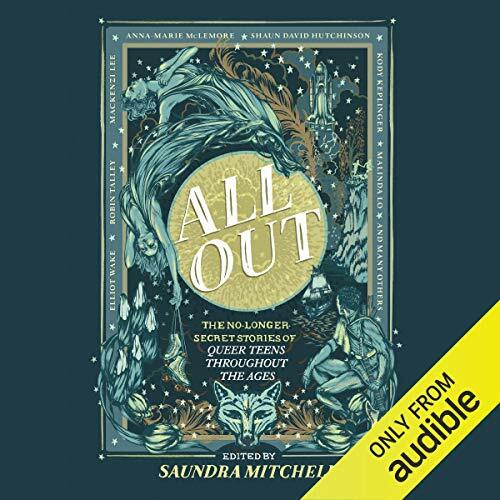 ©2018 Saundra Mitchell (P)2018 Audible, Inc.